A guest blog by Ben Knight a social work student on placement on the Wellbeing project at Refugee Action. Ben worked with the arts drop-in group at Refugee Action to create a banner with positive messages about refugees and asylum seekers in Manchester. 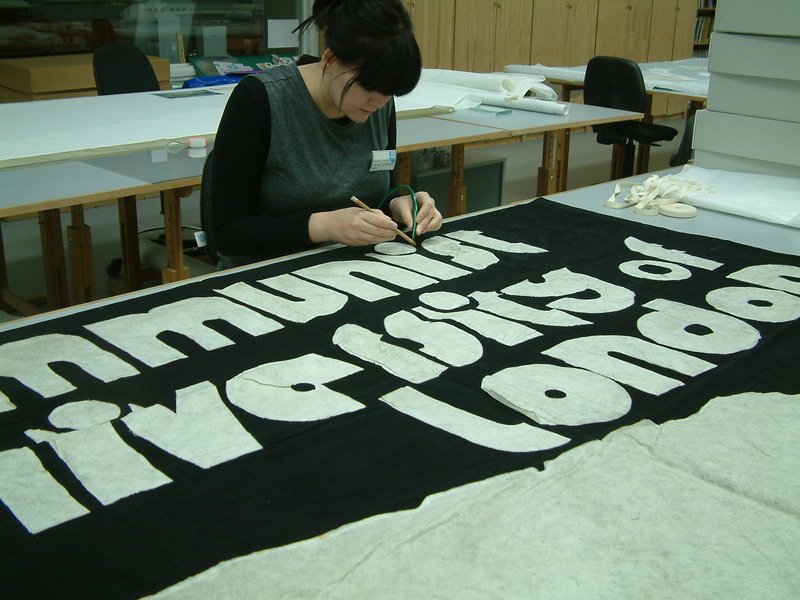 As the collection at the People’s History Museum demonstrates – the making and displaying of banners has always been present at protests and marches. They are an essential way for the uncounted or underrepresented to make their voices heard loud and clear. For the weekly arts drop-in at Refugee Action we wanted to create some banners that are inspired by the rich tradition of banner making on display at the People’s History Museum. Many of the participants in the group have experience organising protests around asylum issues such as the ‘Shut Down Yarlswood Detention Centre’ campaign and we wanted to channel this energy into creating some positive messages about refugees and asylum seekers in Manchester. During the designing of our banners the educational resources made available by the People’s History Museum were invaluable. These resources included some symbols that have appeared on protest banners throughout history, including images of unity, diversity and collective action. The sessions resulted in two banners, one based around the phrase ‘Refugees Make A Greater Manchester’ and an ‘Asylum Seekers Welcome Here’ banner. 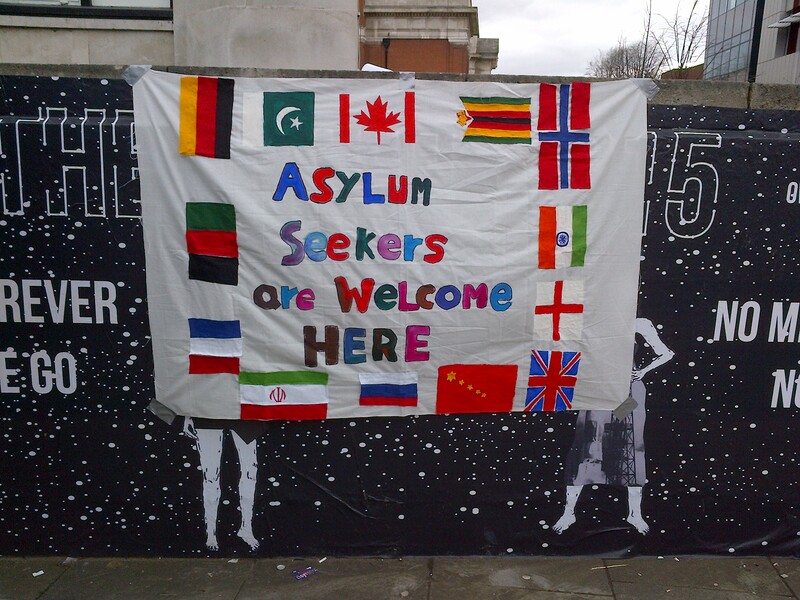 Both banners are on display in our office at Canada House, and the latter banner was used by Manchester University students at a recent pop-up campaign to raise awareness of asylum issues on the streets of Manchester. Of our art-sessions, regular participant Bisham Dass says, that the art-sessions ‘aimed to provide a means for stress relief and emotional healing for asylum seekers and refugees who have been victims of abuse and hardship, and are in need of a mental sanctuary’. The banner making session was a stimulating and thought provoking activity and we’re all pleased that the banners could be used in a public campaign. If you would like to find out more about Banner Making workshops at People’s History Museum please contact the Learning Team. 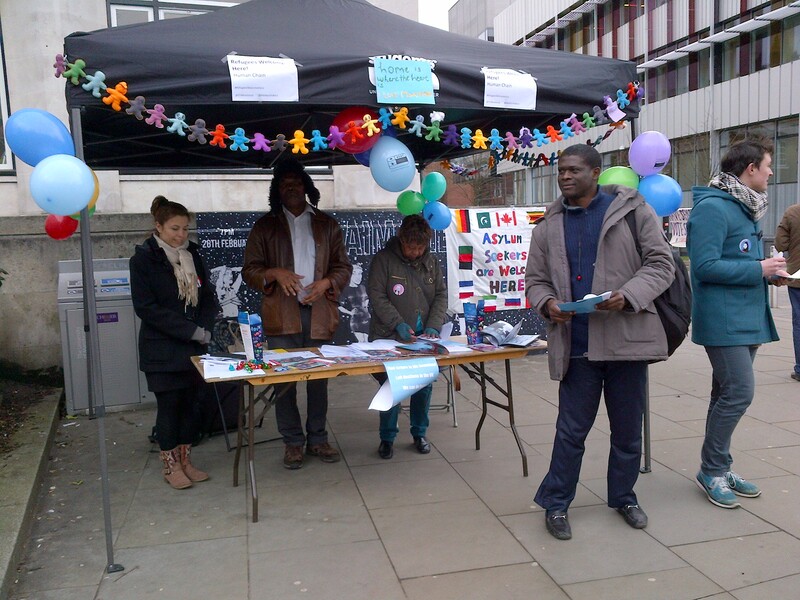 Refugee Action are one of our Parliament Week partners. Find out about our programme of events inspiring you to change your future. The Textile Conservation Studio here at PHM takes in private work as well as caring for our collection which helps to support the running of the museum. 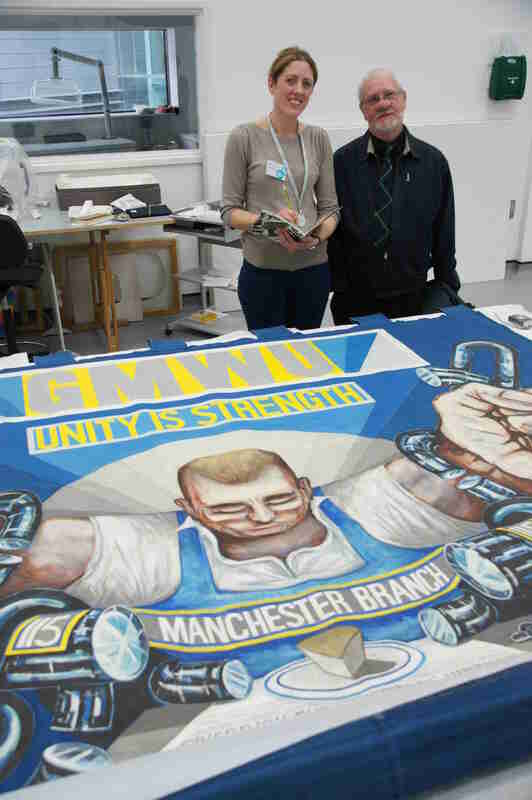 I recently had the pleasure of working on a banner belonging to the GMB union. This was an interesting project for me not only because the banner is still being used, which presents specific conservation issues, but also because the artist who created the banner was able to provide valuable information about the object which informed the treatment. 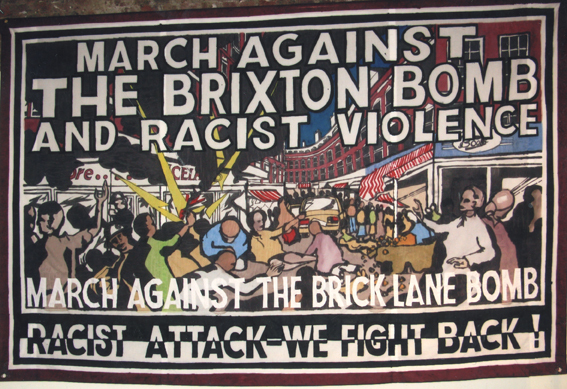 The banner in question was designed and made by Scottish artist Andrew Turner. Turner was born into a coal mining community and his early experiences as a miner’s son feature heavily in his work. In 1961 he attended Edinburgh School of Art but was later expelled for organising a student demonstration. He went on to study at the Leeds College of Art before attending the Royal Academy as a postgraduate in 1971. 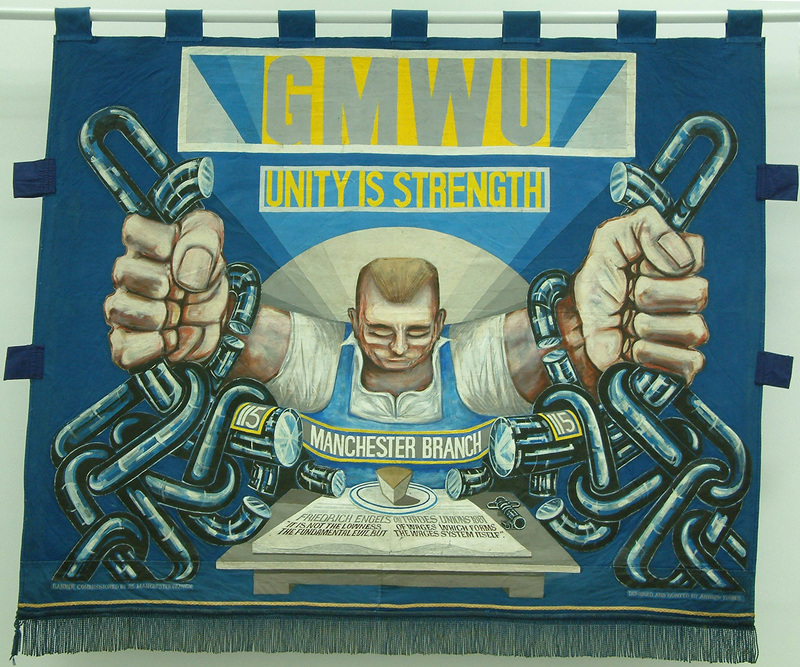 The banner was commissioned by the Manchester branch of the GMB (then GMWU) in 1977. 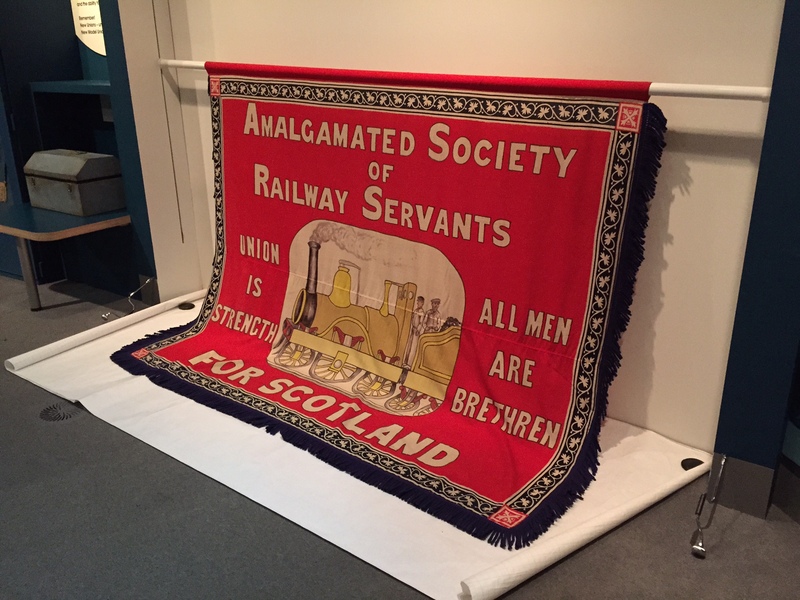 The brief was to produce a banner which represents the strength of the working class, depicting the ongoing struggles but also hope for the future. The design put forward by Turner featured a muscular proletarian figure positioned in the centre with his head facing down; eyes closed and fists outstretched breaking the chains which bind him. Turner recalls that the figure was christened by a young shop steward at the unfurling of the banner who thought he looked like the Incredible Hulk. Other symbolic references are included such as the negotiating table which appears often in Turner’s work, a key and a small piece of cake. An open book sits on the table with a quote from Engels ‘It is not the Lowness of wages which forms the fundamental evil but the wages system itself.’ It is painted onto heavy-weight blue cotton sailcloth; the colour was a controversial choice because it is has conservative associations but in an art history context, blue symbolises hope, which is why Turner favoured it. Turners working process involved stretching the fabric out under tension and pinning it to a frame before applying a primer layer and blocking out the design using scale drawings. The painting was worked up in thin layers with drying time in between. The style of painting is quite expressive with shading used to pick out the shapes and make the image look three dimensional and dramatic. The figure and chains are depicted with exciting, dynamic marks which suggest movement and aggression whereas the text is worked very neatly in flat colour with sharp clean lines. It is quite rare for a conservator to be working on an object and be able to consult the maker or artist about the treatment of their piece. So when the opportunity arose to meet Andrew Turner we didn’t hesitate to invite him to the studio to see the banner he finished painting 35 years ago. Turner was delighted to be re-united with his work and was pleased to see it was still in good condition despite being used on marches for many years. For me the experience really enhanced my appreciation of the banner and although the insight provided by Turner did not alter my treatment plan, it confirmed that my approach was appropriate for the materials I was dealing with. The banner was painted with good quality artist’s acrylic paint. This media is a modern material and still commonly used by artists today, it does however present problems for long term preservation. Even when dry, the paint film remains quite soft which means it can be easily damaged; this also means that dust and other types of particulate soiling can become embedded in the surface. Cleaning all types of paint can be very difficult because water and other solvents can react chemically and cause more damage. In the case of acrylic paint, research is still being done to find safe ways of cleaning which do not alter the original quality of the paint. With this in mind my treatment plan for the ‘Hulk’ banner was to surface clean and stabilise cracks in the paint film without full scale wet cleaning of the paint. The first stage of treatment was a thorough surface clean; this was done using a low suction vacuum with a screen placed across the object to protect the painted areas. The non-painted areas were worked over more thoroughly using soft brushes and the vacuum. 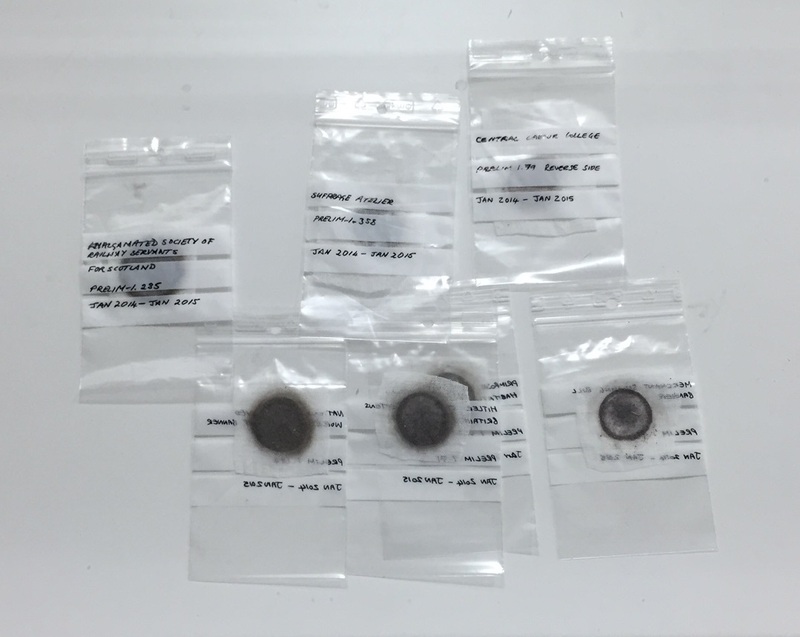 Any dust removed was captured on muslin traps inside the vacuum nozzle; this allows us to assess the condition of the textile and the type of dirt coming off. In this case, a surprising amount of dust was found on the traps along with loose fluff, dislodged paint flakes and a lot of blue fibre from the fabric itself. The second stage was a series of tests to establish the suitability of possible consolidants for the painted areas and then work began on stabilising the cracked and flaking paint. The consolidant is a type of adhesive, it is transparent and no attempt is made to ‘touch up’ missing areas. 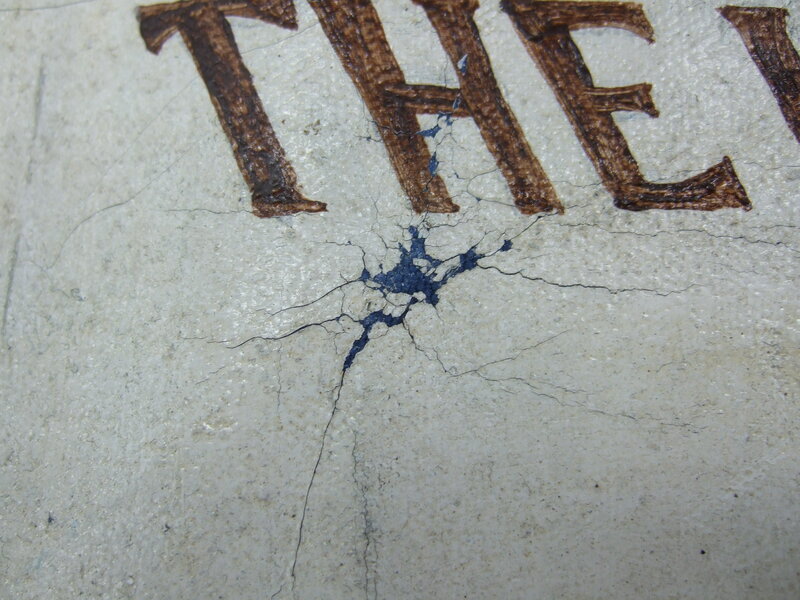 In most cases conservators aim to do what we can to preserve the original material rather than make something look new again. In addition to stabilising the paint some humidification was done to ease out creases across the top of the banner, unfortunately some creases in the body of the banner have set in with the stiffening of the paint over time and will now be impossible to remove. As part of the treatment a special banner bag was made to make it easier for the client to store and preserve it, advice was offered for its ongoing care with the hope that it will be enjoyed for years to come. At PHM we collect objects which have a story and this is often told through the physical condition of the piece, if a banner has holes or stains these may be a clue to how, where or why it was used. As is often the case with social history collections we sometimes deal with complex objects made from a variety of materials, many of the textiles I treat show signs of wear and tear or may be disfiguring if viewed in a different context. It is my job as a conservator to preserve this evidence while ensuring that the object is safe for storage and display. As well as maintaining our existing collection and preparing objects for display we treat new objects as they come in. When a new object comes into the Textile Conservation Studio the first thing I do is a condition report, this is a detailed document which I use to assess the current condition and will help me to track any future changes so the next time it is taken out I can compare against the report. I also note down as much information as possible about the object including a physical description, take measurements and lots of photos. 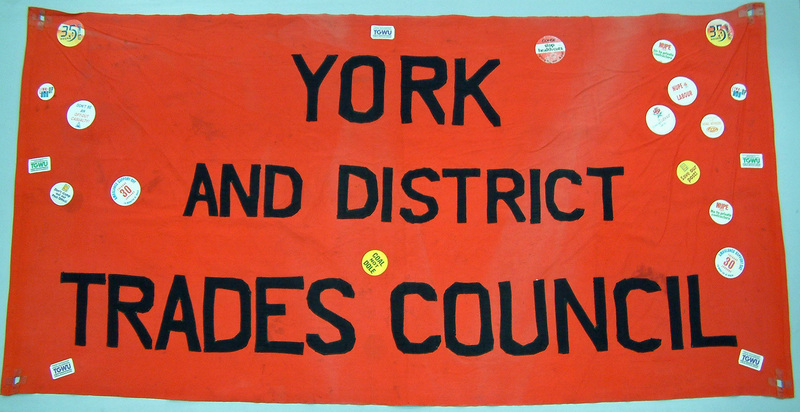 An example of this approach is a banner I recently worked on, it was donated by York and District Trades Union Council in 2014. 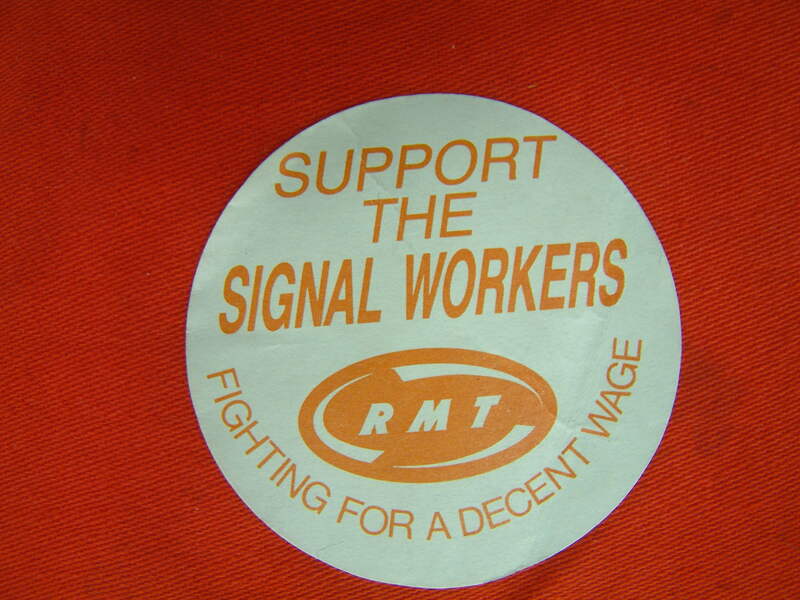 It was made in 1975 but was used by the York TUC in fairly recent rallies. It is a single sided banner made from one length of red cotton sateen with appliquéd black cotton lettering cut out and machine sewn to the cloth. The interesting thing about this banner is that it is adorned with 21 self adhesive stickers pertaining to different campaigns when the banner was used. 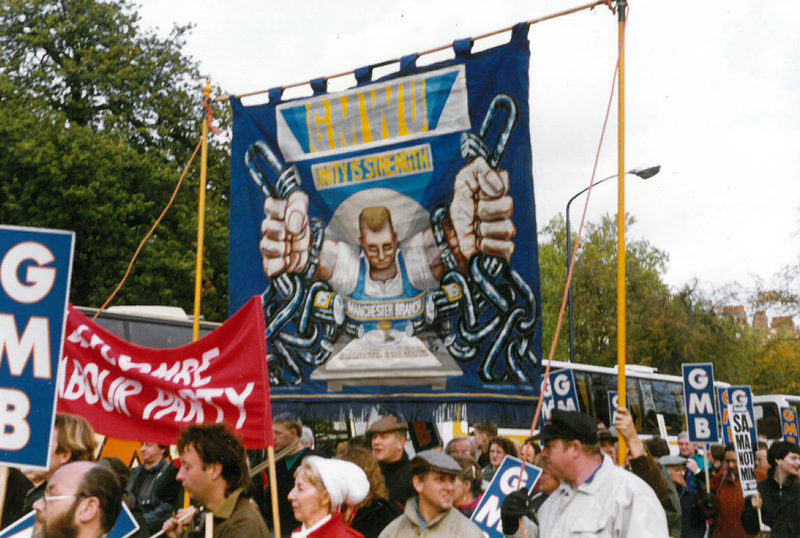 We know from images provided by York TUC that the banner was taken on several marches from an anti-nuclear demo in 1980 where the banner appears to be fairly plain to the signal workers rally in 1994 when you can see from the photo that many stickers have been added. As part of the conservation I carefully assessed each sticker and noted its condition, although most are now well adhered to the fabric beneath, this could change over time meaning I may need to adjust my treatment. When these stickers were made they were probably not expected to last long, but this ephemeral nature is part of the reason we value such items, if they weren’t being cared for in museums they might be lost forever. 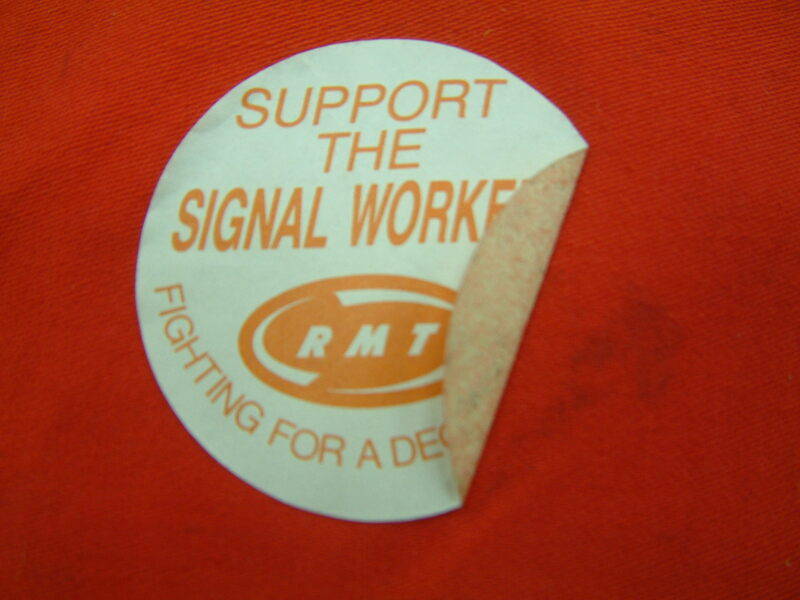 Some of the stickers were coming loose so they required treatment to make them stable and fit for display. To do this I used small amounts of conservation grade adhesive applied in patches underneath the loose areas. This provides adequate support without forming too strong a bond and can be removed if necessary in the future. The banner was also quite creased from folding in storage, and in diagonal lines running across from the corners. As a rule we do try to smooth out creases because they can distort the fabric and eventually lead to splits and tears along the crease. With this banner, the fold lines were eased by introducing moisture as vapour and weighting down the creases, basically a really gentle form of ironing! The diagonal creases however were not treated because they demonstrate how it was carried, between two poles with little or no tension across the top. 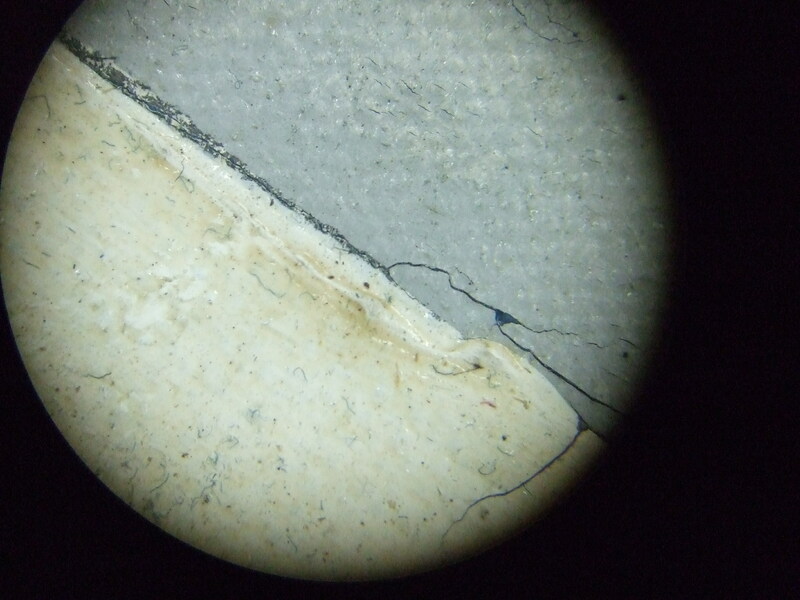 Of course this creasing will need to be monitored to make sure it doesn’t deteriorate and cause further damage. This is the balancing act we play as conservators, trying to preserve as much physical evidence as we can without putting the object at further risk. 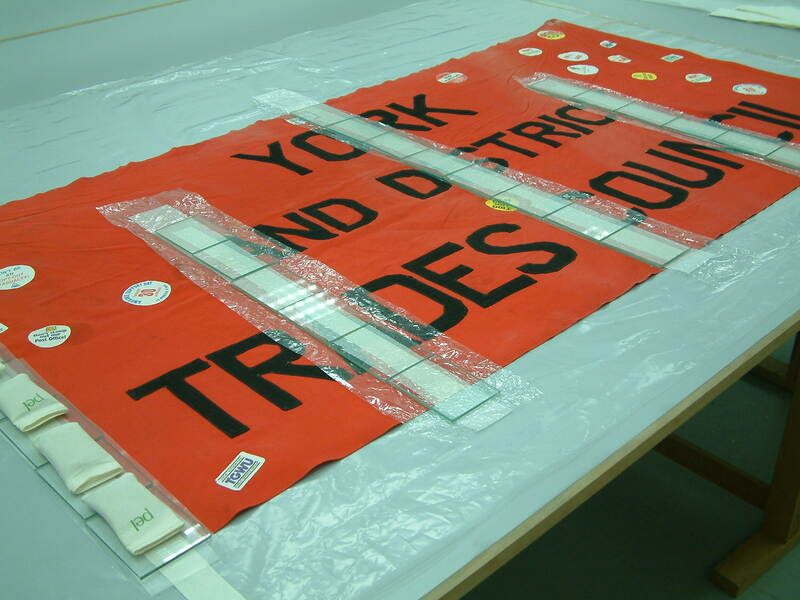 For the time being the York TUC banner has been wrapped up for storage but it will hopefully be on display soon. In the meantime please come and see some of the other wonderful banners which have been lovingly treated and installed by our conservation team. Every year during the first two weeks of January the PHM change over the banners on display in the main galleries. This was particularly exciting for me as Monday was the first day of my new job as a conservator here in the Textile Conservation Studio. This week we have been hard at work putting a new selection of banners on display and taking the old banners away for a rest from light, dust and the physical strain of hanging vertically. Here at the PHM the main galleries have been designed with a nifty system to make it easy to change over banner displays. Each banner hangs from a long pole inserted through a sleeve at the top of the banner. The pole is then gradually raised or lowered into position using a pulley system which is hidden behind the walls. To remove banners from display we carefully lower them down, rolling them as we go. We then take them to a large open space and lay them flat out on the floor (they are too big for tables) and gently vacuum both sides to remove any dust which may have accumulated in the past year. We vacuum them through a mesh screen to protect the delicate surface of the fabric and also put a piece of muslin inside the vacuum nozzle to allow us to collect the dust. This is really helpful as it allows us to monitor exactly what sort of dust and fibres are being removed, i.e. general dust from the carpet or fibres from the banner itself. The banners are ‘put to bed’ until the next time they are displayed by rolling them onto large cardboard tubes, and wrapped up in acid free tissue paper, calico and Tyvek® (a non-woven polyethylene fabric) . We take a lot of care when rolling the banners to make sure that no creases are formed as these could turn into permanent distortions or splits in the future. When we put banners up on display we follow the same procedure in reverse, carefully unrolling the banner as it is raised up. To put the finishing touches on the new display we make sure the that banners are lit in the right way; bright enough so that visitors can see them clearly but not too bright as this would cause the fabric to fade. The final step is to put barriers in front of the banners to deter people from touching them, as even clean hands can leave traces of oils and salts on the fabric which would cause the fabrics to deteriorate. Being a textile conservator is an exciting and wide-ranging job. 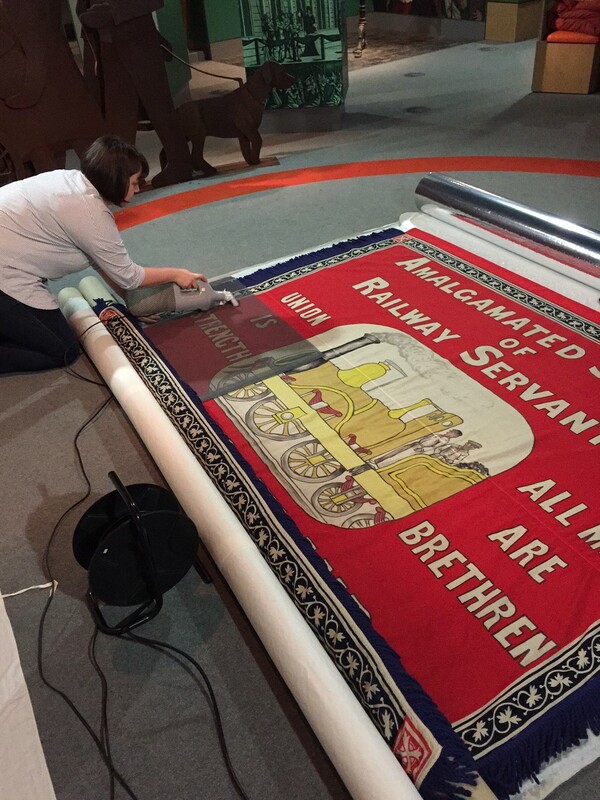 Working with large flat textiles like banners means that our job varies day to day from carrying out painstaking precise treatments at a workbench to kneeling on the floor or carrying heavy objects. I have really enjoyed my first week at the PHM and hope all our visitors enjoy the new display. If you want to find out more about the work that is carried out in the Textile Conservation Studio, pop up to Main Gallery Two where you can peek through the window into the studio, or join us for one of our quarterly tours. 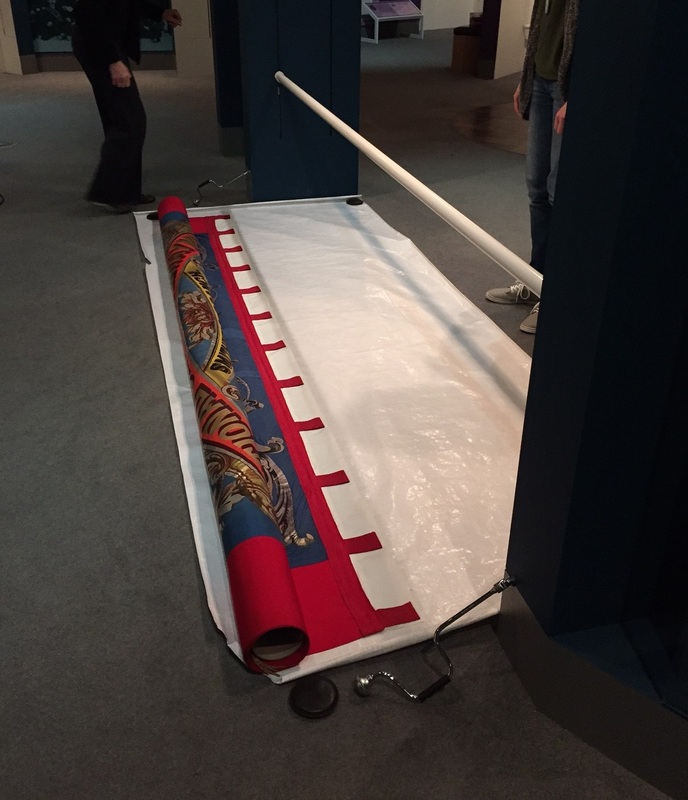 Our Senior Conservator, Vivian Lochhead reflects on the process of getting our banners ready for their annual changeover. It is that time of year again; one of the landmarks that punctuate activities through the conservation calendar. The collections team are busy selecting banners for the next annual change of free-hanging banners in the PHM main galleries. 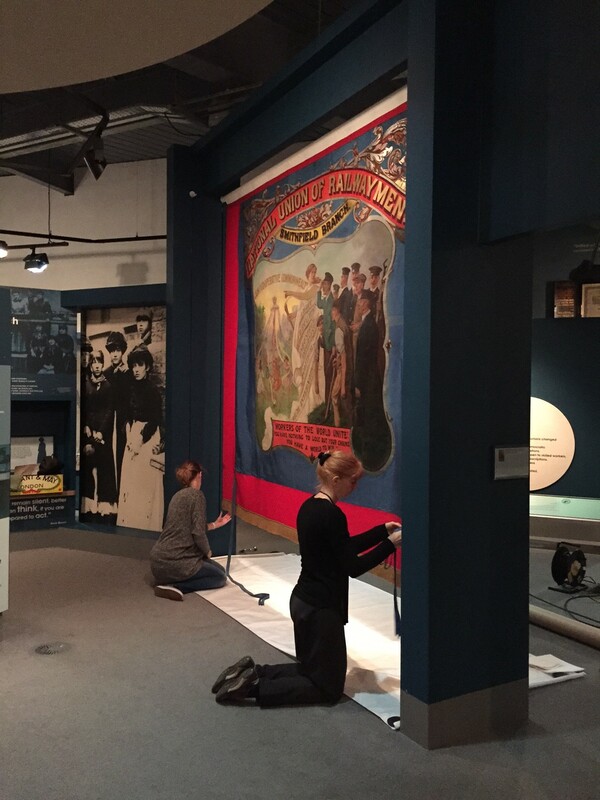 This collaborative process involves exhibition, curatorial and conservation staff to ensure selection of banners appropriate to the displays and that each banner is either already fit to hang or can be made so in time for the actual exhibition change. This is timed for early January each year to minimise disruption to gallery visitors and especially learning groups as, for safety reasons, we have to close each gallery during the change-over. Now into my 25th year as Senior Conservator at the PHM, the annual process is both exciting and nostalgic. 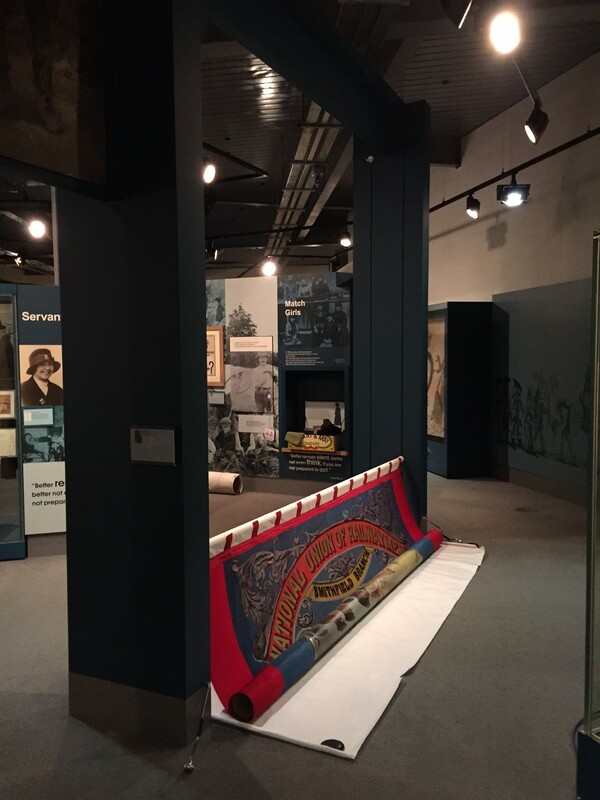 The opportunity to be reacquainted with previously displayed banners can be evocative and enlightening, presenting the chance to re-examine previously conserved banners and to assess how the treatment is bearing up to the demands of display and handling required of the collection. 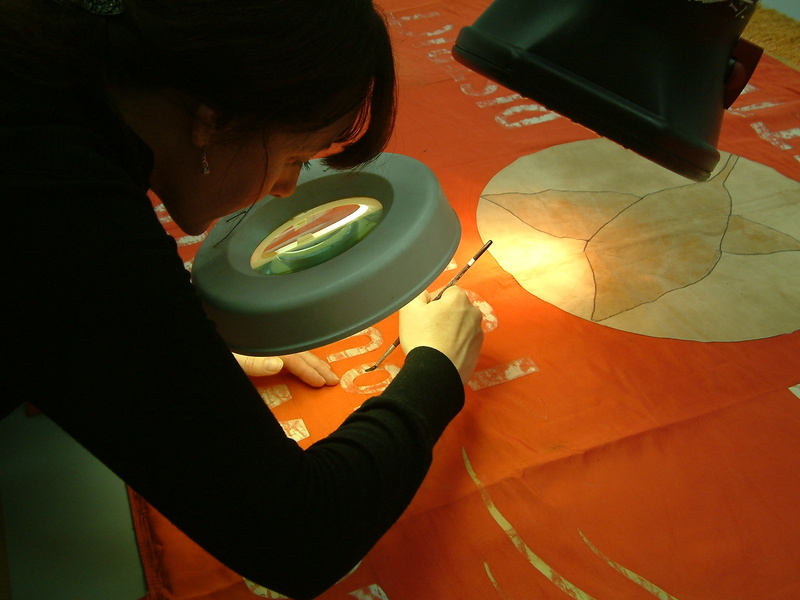 Conservation treatment aims to prevent deterioration and preserve the banner. It can massively slow down but not halt the process of decay. Some materials and construction methods used to make banners cause them to be more susceptible to deterioration. Certain types of degradation are imperceptible to the eye as they happen at microscopic level, but the overall effects can be catastrophic. Painted silk banners, for instance, can fracture without warning or obvious sign of weakness. Consequently once selected for display each banner must be thoroughly assessed, even if it is a familiar friend. 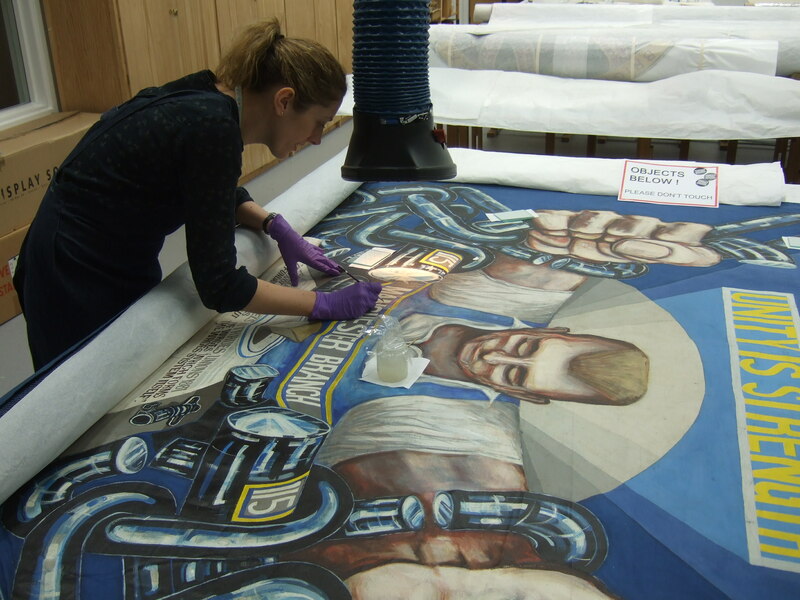 Newly acquired banners deemed suitable for exhibition in the galleries will be checked and any necessary conservation treatment carried out to ensure they are in good condition for the 12 month display period. Pre-display assessment and conservation activities usually begin in October, allowing visitors a tantalising preview of next year’s banners and the intensive treatment each one receives. 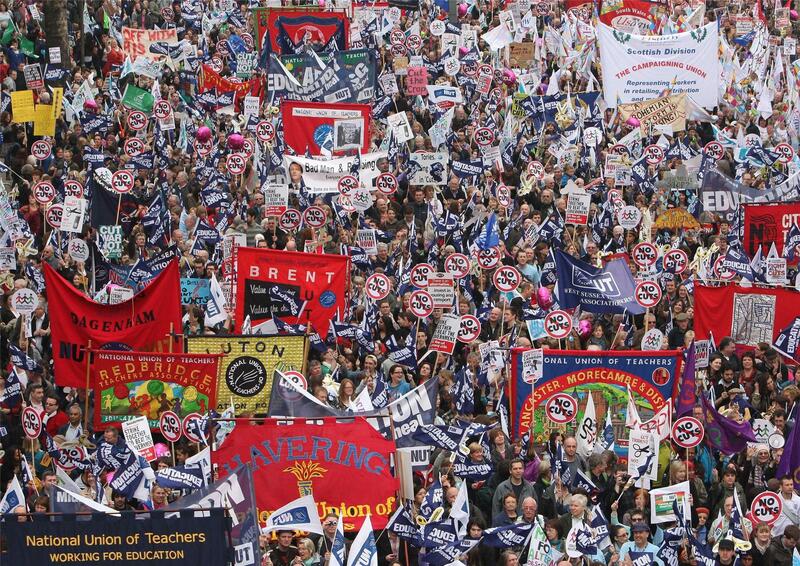 What if… banners were never used as part of campaigns and demonstrations? On Thursday 15 May, the PHM will explore alternative histories for Museums at Night. Join our hypothetical tour guides as they weave tall tales and ask you to imagine infinite possibilities of what might have been. In a series of blog posts before the event　we’ll be featuring questions so you can swot up on your hypothetical history and add your own alternatives. On the night we’ll subvert our timeline with your suggestions. In this blog, our Director, Katy Archer asks What if… banners were never used as part of campaigns and demonstrations? Our museum is full of fantastic, beautiful and colourful banners. 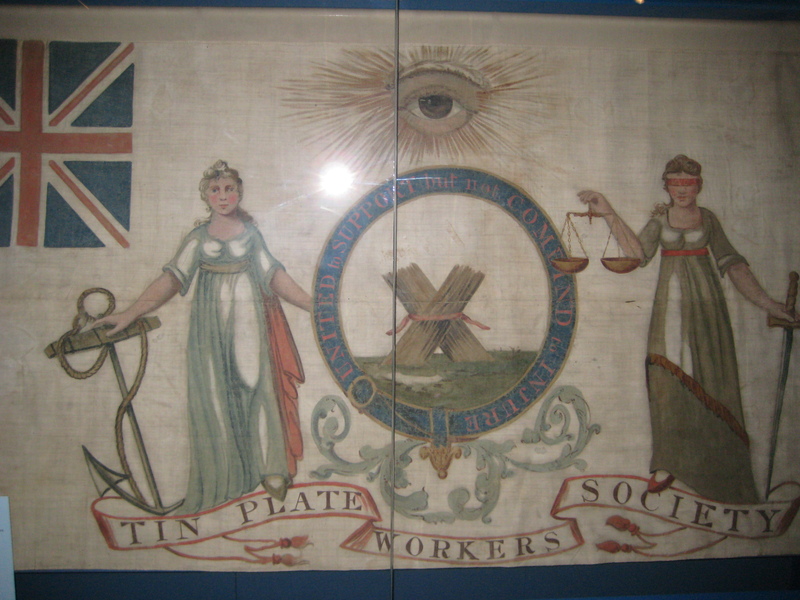 From the Liverpool Tinplate Workers banner from 1821 through to the Mansfield Labour Party Women’s Section in 1988, we are very proud and privileged to be the custodians of such an essential part of the history of the development of democracy in our country. As the ‘home of ideas worth fighting for’ we showcase a wide range of campaigns from a wide range of organisations and groups who have fought for a cause… and who have all used banners as an effective tool and technique in their campaigns. Our banners to me are works of art, they are full of meaning and messages. They show how people came together united by a common cause – and were, and still are, objects of great pride. When you see each of our banners on display individually or collectively, they are not easily forgotten. They provide a lasting legacy (through the work of our amazing conservation team!) of the ideas that people have fought for… equality, democracy, peace, reform, co-operation and many more. And they’re still current and contemporary too – look at any images of footage of recent protests and marches and you’ll see great numbers of banners still being used today. 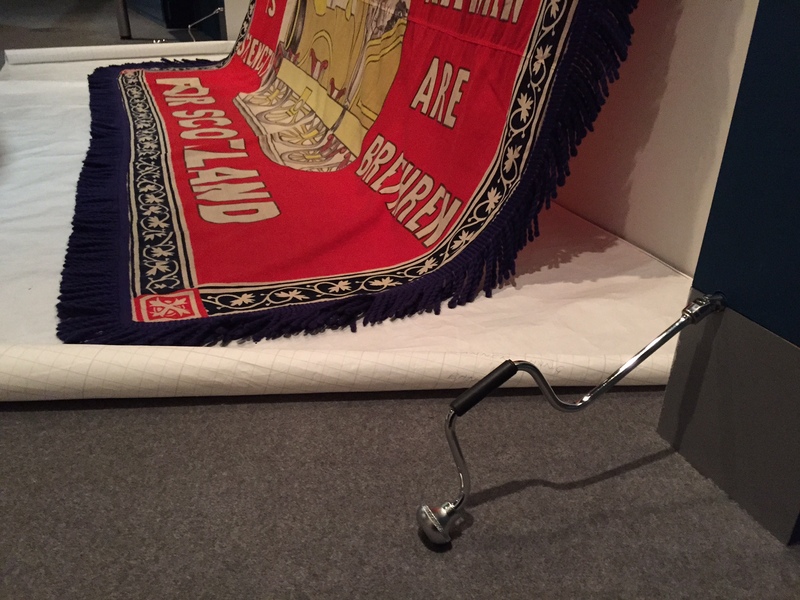 And they are still being made today as well – our recent exhibition with Ed Hall displaying the work of a contemporary banner maker still using the traditional tool and technique to give voice to current campaigns. But what if… banners had never been part of the campaigning tradition? Or what if… the tradition died out years ago to be replaced by digital alternatives with no ‘real’ substance? 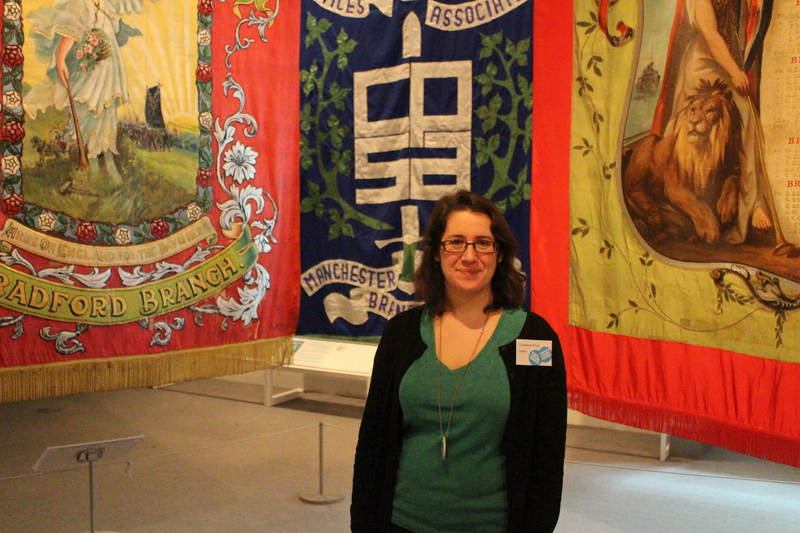 What if… none of the banners in our collection had survived to be seen by our visitors today? How would we know and see what people have fought for and still fight for today? How would people today be connected to past campaigns in a way that creates such an emotional response? And which moves people to fight for something that they believe in today? What else would have had such dramatic impact? Add your answers below and come along to our Museums at Night: What if…? event on Thursday 15 May, 5.00pm – 8.00pm to see our beautiful banners for yourself and have your say about what if… they never existed! ?